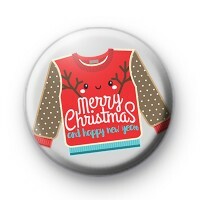 Such a fun Christmas Jumper Badge with a sweet Xmas Message written in it. Merry Christmas & a Happy New Year. This Xmas badge is perfect to wear on your school or work clothes when you can't wear a full on Christmas jumper. It is also great for decorating stockings, placemats and other soft furnishings at Christmas. Many customers add our Christmas Button badges to Christmas cards and make for the perfect handmade Stocking Fillers. Make sure to check out the Christmas category to see lots more festive designs.